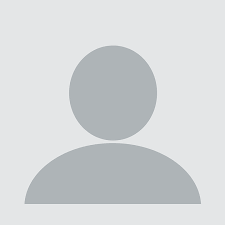 All in one landing page solution built for anybody who uses landing pages. Sign up now and get full featured access to LanderBolt. Already a LanderBolt member? Login here. No landing page skills? No problem. Create high converting landing pages in minutes. No web design or coding knowledge required. Start with our library of starter templates, or simply import any page you’d like using our new Universal Page Import feature. One click publishing & unlimited visits. It’s never been easier to launch a campaign. Add a custom domain and publish your landing pages in a single click. Want a pretty URL for your landing page? We have you covered with unlimited sub domains and url customization options. 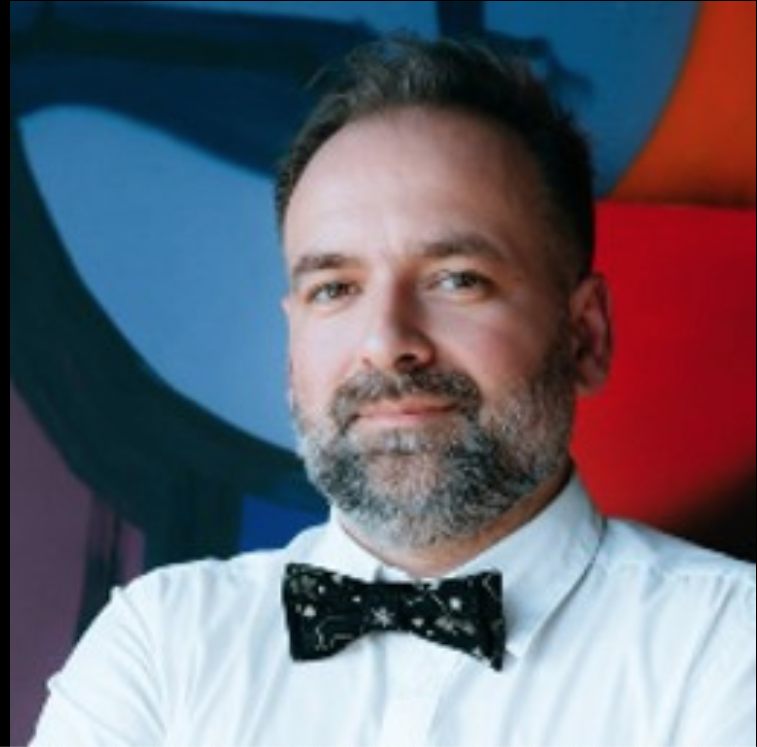 Unleash Your Creativity & Maximize Your ROI. Easily change your landing page’s design, content, images, fonts, colors, and more using our powerful page editor. Improve your campaign’s ROI dramatically by split testing; made simple with our one-click page duplication feature. Unimaginably Fast Page Load Speeds. Stop Losing Traffic Due To Slow Servers. Did you know that most sites lose half their visitors while loading? 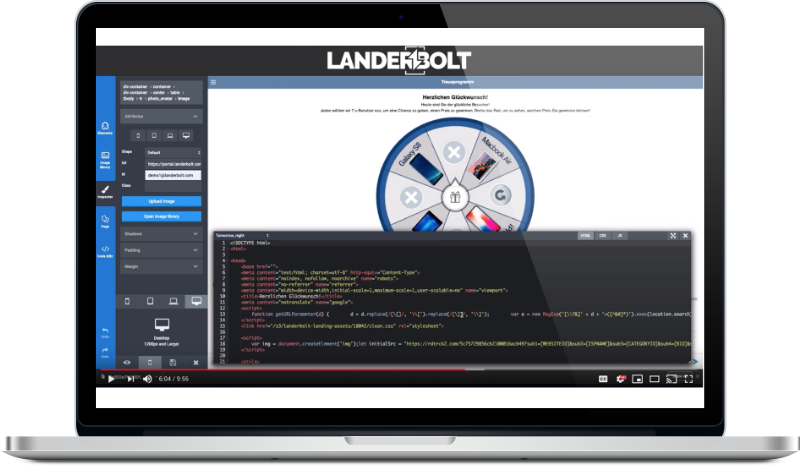 Your LanderBolt landing pages are automatically optimized and hosted from lightning fast servers all over the world. Whether your visitors are from the USA or Australia, they wont be waiting for it to load. 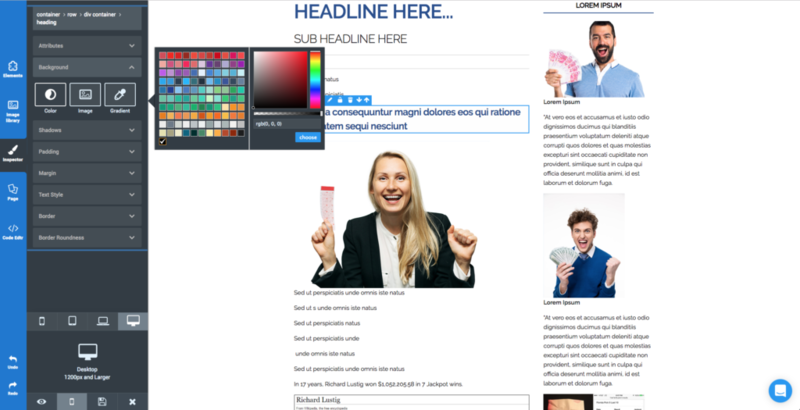 New for 2019, try our breakthrough Universal Page Importer. This feature allows you to import any landing page you can find on the internet by simply providing the URL. Upon import, your landing page is automatically cleaned from malicious code and optimized for the fastest page load speeds. Download a .ZIP, Edit your newly imported landing page easily with our visual page editor, and publish to your own custom domain in a single click. Instantly Publish Pages To Your Tracker. Configuring landing pages correctly in your tracking software can be tedius and time consuming. Let LanderBolt do the heavy lifting with our one-click tracker integrations. Your landing pages will be published to your tracker, and changes you make are automatically synchronized. Spend less time configuring, and more time improving your ROAS. We support most popular trackers, including Voluum, ThriveTracker, FunnelFlux, BeMob, AdsBridge, RedTrack, and TrackRevenue, with more being added frequently. 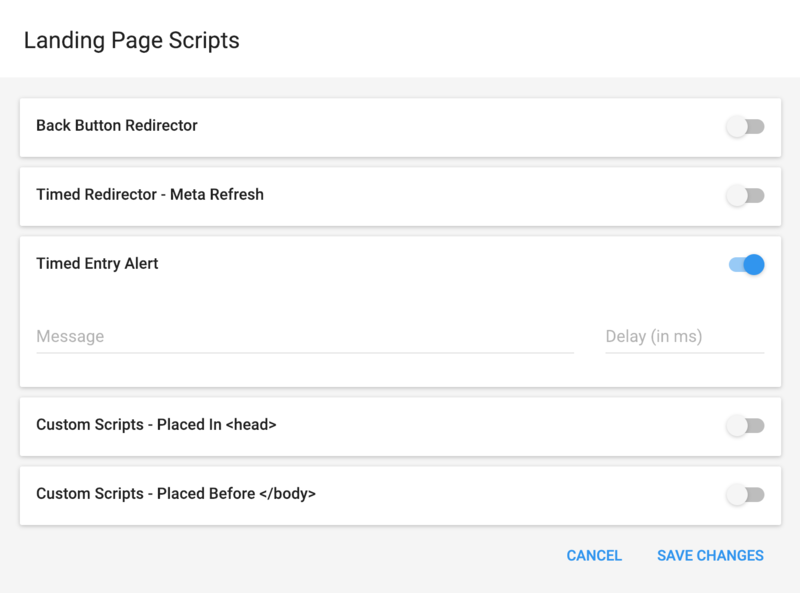 Activate a suite of powerful ROI-boosting scripts on your landing pages with the simple flick of a switch, including a back button redirector, timed page redirector, entry popup, and more. Place your custom tracking scripts and pixels with ease and without having to access your landing page’s code. You can also do this in bulk and save time. Our landing page template library includes top performing pages in categories such as advertorials, sweepstakes, and more. All templates work beautifully on desktop and mobile devices. No more worrying about server bandwidth or overage fees. 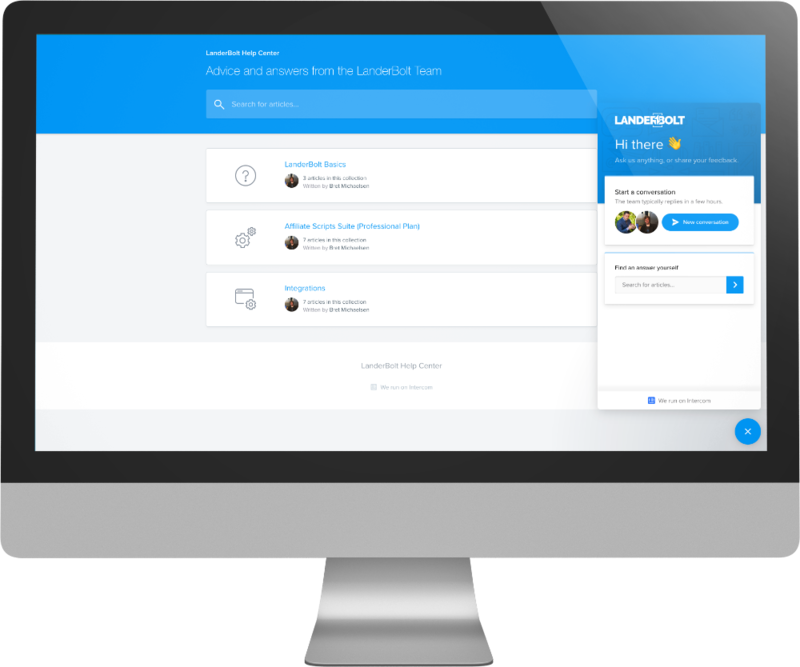 With LanderBolt, you get unlimited landing page visits. Publish your landing pages to your own domains, and add an unlimited number of sub domains. All managed from a simple dashboard. Save time with our simple one-click tracker integrations. 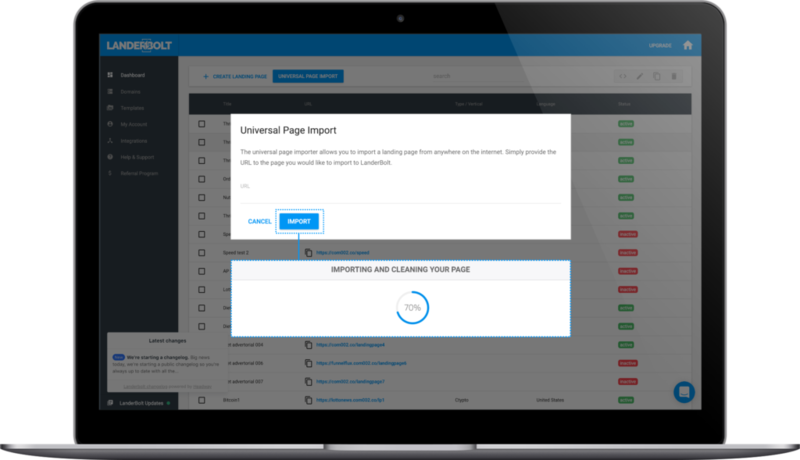 Publish and sync landing pages to your favorite tracker instantly. Have a question or problem? Start a live chat anytime to speak directly with our development team. Contact Us Click Below to Schedule A Personalized Demo. Can I use my favorite tracker with LanderBolt? Yes. 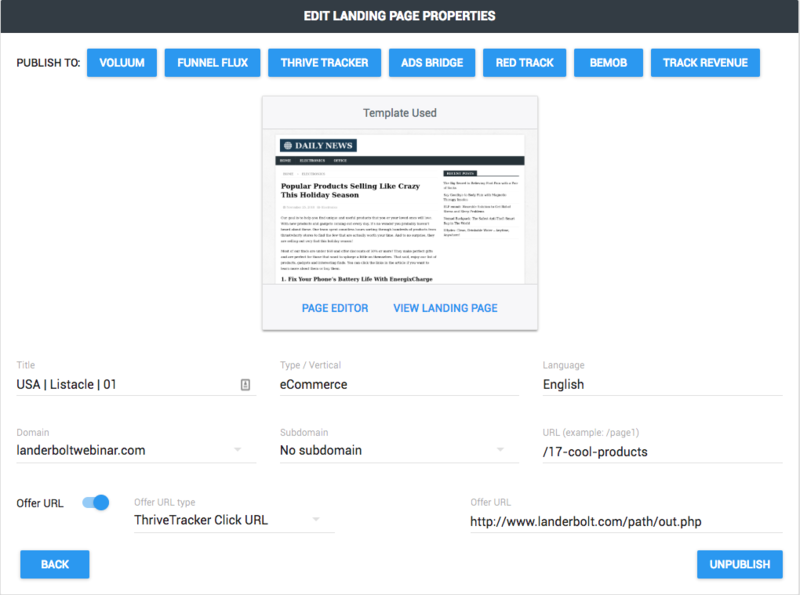 LanderBolt offers a simple integration with most trackers which enables one-click publishing of your landing pages to the tracker. You can also copy and paste your LanderBolt URL of your trackers landing page section if your tracker is not yet integrated. In order to publish pages to the internet with LanderBolt, a custom domain can be added to your account. Adding a custom domain is very easy and takes only a few minutes. Currently, we support the following payment methods: Visa, MasterCard, American Express, JCB, Discover, and Diners Club. You may change your payment method at any time from your account settings page. How does the Universal Page Importer work? 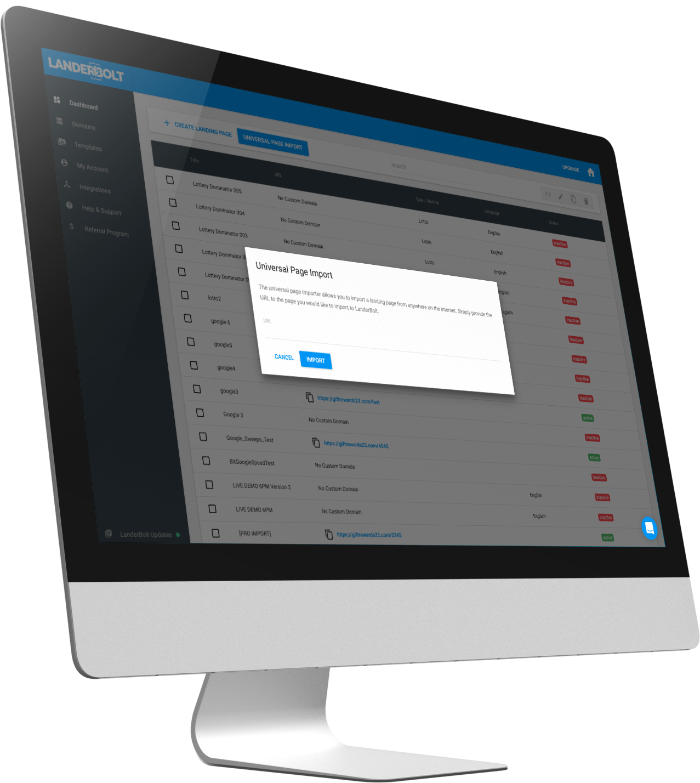 Our Universal Page Importer feature is available on all LanderBolt plans, and allows you to import landing pages from the internet by simply providing the URL. If the page is receiving live traffic and configured to work with a tracking platform, you can keep all of your unique code by un-ckecking the two default options. Once it’s synced you can rotate the LanderBolt page into live traffic instantly. Can I run high volume traffic with LanderBolt? Yes. We have designed our systems to handle very large loads of traffic. Our customers run all types of traffic sources from popunder to native, PPC, social, and more. We have designed redundant 99,9999% uptime systems so you do not have to stress about your landers not loading due to server issues. 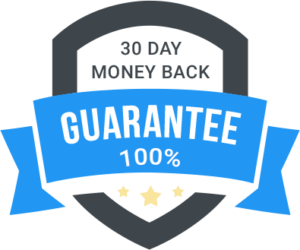 Our Free Trial is our iron-clad 30 day money back guarantee policy. So there is absolutely no risk to you if you decide it’s not for you we’ll gladly issue you a refund, and give you an additional 30 days free. We offer Enterprise Plans for 2 or more people. You’ll save 20% or more over individual and get access to additional collaboration features. 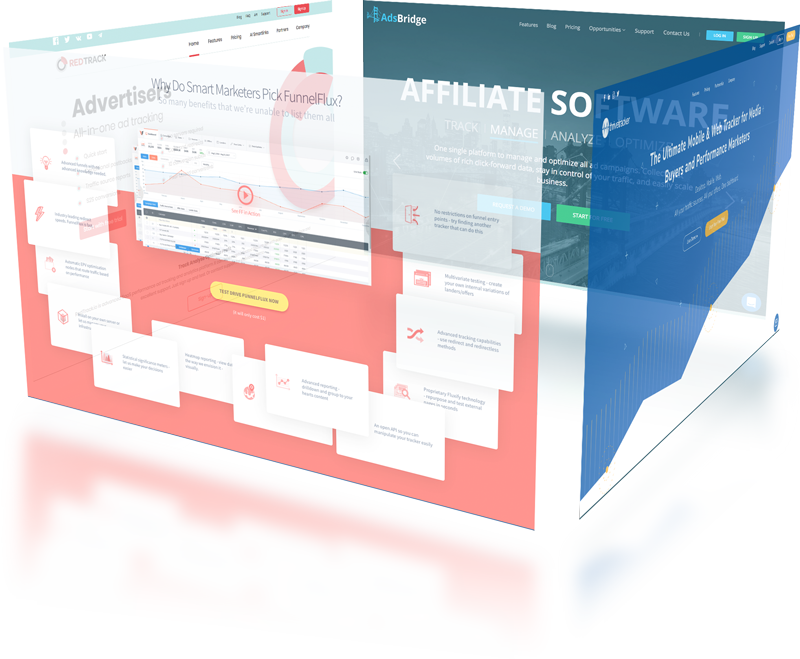 Landerbolt is the the best landing page builder that I have used and have used Leadpages, Clickfunnels and others. It has the fastest loading time and the technical support is excellent. I highly recommend them.